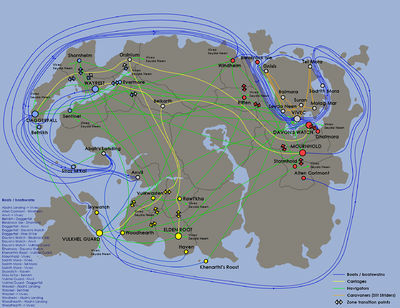 A map showing available boat and carriage travel routes throughout Tamriel. 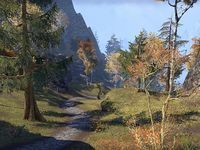 There are a number of different transportation and travel services that can be used to get across Tamriel in Elder Scrolls Online. Wayshrines provide access to the fast travel network in the game, and you can travel for free from any wayshrine to any other one that you have previously discovered. You can also teleport from anywhere in the wilderness to a wayshrine you have discovered for a small level-dependent fee, but the fee dramatically increases after you teleport, and takes five minutes to reduce to its normal level. If you get stuck anywhere due to a bug you can request 'help' which will transport you to the nearest wayshrine for a fee. Wayshrines can also be used to travel directly to the Harborage or certain dungeons, though they are one-way trips. 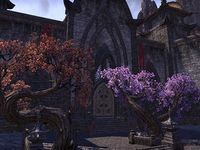 There are also wayshrines in Eyevea, The Earth Forge, and your alliance's two Gate Keeps in Cyrodiil, which can be used to travel from these locations to any other wayshrine. These are also one-way only. 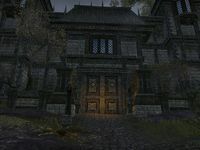 In the game, there are numerous ways of fast travelling: using a wayshrine, joining another player, traveling to a player house, and recalling to a certain wayshrine. Note that none of these methods are available within Cyrodiil. The fourth method can be used anywhere, and requires using the "/stuck" command. Direct wayshrine-to-wayshrine travel is the most common means of fast travel. To do so, simply activate any wayshrine, and you can travel to any other wayshrine you have previously discovered. This includes several one-way wayshrines which you can travel to but not from - such as those at The Harborage, Group Dungeons, and Trials. 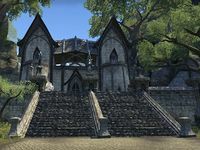 There are also a few wayshrines you can travel from but not to, including those at Eyevea, the Earth Forge, and Cyrodiil. Direct wayshrine travel is instant - you can even do so while being attacked provided you're quick at choosing your destination. To join another player, open up your friends list, your group window, or your guild roster(s), and find their name. Right-click it and select "Travel to Player". This is only allowed if the player is in a zone you have access to and they are online. (E.g. they are in a DLC zone which you do not have access to, or the player is in a group instance and you are not in their group, you cannot travel to them.) If the player is in your group, and in a group instance, you can travel to them regardless of Alliance. Note that this will take several seconds to transport you, during which you must not be interrupted. If you are attacked while attempting to teleport, it will not work. Note that you will not arrive right next to the player, but at the closest wayshrine instead. This method can be used to discover new wayshrines. Additionally, you can transport yourself directly to any wayshrine from pretty much anywhere (except Cyrodiil). To do so, just open your map screen, select a wayshrine you have discovered, and choose to travel to it. This will incur a gold cost, which increases if you do so again a short time after. Like travelling to a player, there are several seconds during which you will be interrupted if attacked. Finally, there is the "/stuck" command you may type in the chat window, which you can use as a last resort if you get trapped somehow. This also costs gold, and will transport you to the nearest wayshrine, whether you have previously discovered it or not. If you are inside a cave, you will instead be transported directly to a shrine near the cave's entrance. 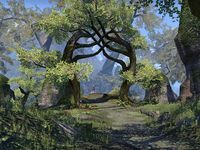 If you are in Cyrodiil, either outside or in a delve, you will be transported to the wayshrine at one of your alliance's Border Keeps. 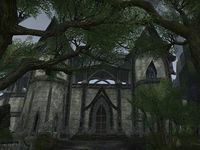 The Transitus Network provides a similar service to wayshrines in the contested region of Cyrodiil, the main difference being that you can only travel to shrines held within keeps that your alliance controls, and only then if those keeps are connected by the network to your current location. Navigators can be found in the main city of each zone, and offer limited travel to the other main cities, both within an alliance and to the other alliances, as shown below. The travel is free of charge. The Dominion Navigator is Selandilwen. The Covenant Navigator is Azoufah. The Pact Navigator is Falvis Raram. Each Navigator will take you to the next-Tier and previous-Tier zones of their alliance, or the same-Tier zone in the other alliances. Navigators were first introduced in One Tamriel (Update 12), with the ones on Vvardenfell being added in Update 14. Boatswains function similarly, but often only able to travel to fewer locations. Self-driven carts can occasionally be found. Activate the cart to be taken to your destination. 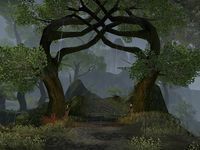 Between Belkarth (Craglorn) and Elden Root (Grahtwood), Wayrest (Stormhaven), or Mournhold (Deshaan). You must have started the quest The Star-Gazers to use the cart from the alliance capitals. Between Orsinium (Wrothgar) and Vulhkel Guard (Auridon), Daggerfall (Glenumbra), or Davon's Watch (Stonefalls). You need to have access to Wrothgar to use it. Note that before completing Invitation to Orsinium, activating the cart in the alliance zones will actually place you near Merchant's Gate. Some boats can be used to travel to a certain destination by activating them directly, without speaking to a boatswain. Ships in Vulkhel Guard (Auridon), Daggerfall (Glenumbra), and Davon's Watch (Stonefalls) can be used to travel between these three cities. You need to activate the steering wheel to travel, with the exception of the Vulkhel Guard - Davon's Watch route, which is served by a small boat. Between Abah's Landing (Hew's Bane) and Woodhearth (Greenshade), Wayrest (Stormhaven), or Windhelm (Eastmarch). You need to have access to Hew's Bane to use them. Between Anvil (Gold Coast) and Vulkhel Guard (Auridon), Daggerfall (Glenumbra), or Davon's Watch (Stonefalls). You need to have access to the Gold Coast to use them. Caravaners can be found in Caravaner Towers in most cities and settlements in Vvardenfell, and offer limited travel to the other towers. The travel is free of charge. 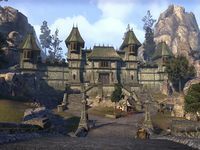 Helseth Sadalvel in Vivec City can take you to Balmora, Suran, Gnisis and Tel Mora. 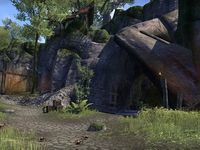 Nevos Sareloth in Balmora can take you to Vivec City and Gnisis. 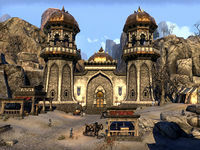 Amili Yahaz in Gnisis can take you to Balmora and Vivec City. Narisa Androm in Molag Mar can take you to Tel Mora and Suran. Medyn Hleran in Seyda Neen can take you to Gnisis and Suran. 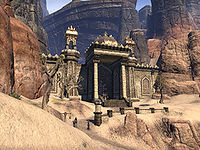 Faven Thendas in Suran can take you to Seyda Neen, Vivec City and Molag Mar. 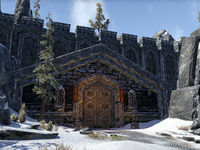 Adosi Delvi in Tel Mora can take you to Vivec City and Molag Mar. Once you complete the Mages Guild questline, one guild hall in every alliance zone will offer a portal to the guild hall in Eyevea. Border Crossings, or Transition Points, are locations where it is possible to cross between Zones on foot. This gate connects Baandari Trading Post in Malabal Tor with the Northern Woods region of northwestern Reaper's March. When you pass through into Reaper's March, the Vinedusk Wayshrine will be marked on your map if you have not yet discovered it. Crossing the other way if you have not yet visited Malabal Tor will unlock Marbruk Wayshrine. 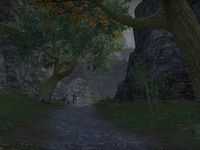 This tunnel connects the northern part of Green Hall in Grahtwood with the southeastern part of Jodewood in Reaper's March. 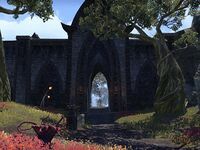 In Grahtwood, the tunnel is located just to the right of a locked gate north of the town of Cormount, while the Reaper's March end is just southwest of the village of Willowgrove. 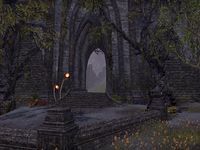 When you pass through into Reaper's March, Vinedusk Wayshrine will be added to your map if you have not yet discovered it. Crossing the other way will unlock the Haven Wayshrine if you have not yet visited Grahtwood. This gate joins the northwestern road of Tarlain Heights in Grahtwood to the city of Marbruk in Greenshade. 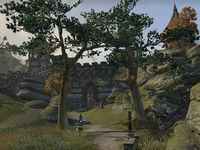 When you pass through into Greenshade, you will enter directly into the city of Marbruk, discovering both the city and its Wayshrine if you have not yet done so. Crossing the other way will unlock the Haven Wayshrine if you have not yet visited Grahtwood. 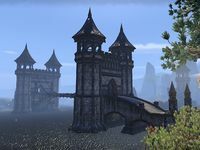 This gate connects the north of Green's Marrow in Greenshade with the city of Velyn Harbor in the Drowned Coast of Malabal Tor. When you pass through into Malabal Tor, you will enter directly into the city of Velyn Harbor, discovering both the city and its Wayshrine if you have not yet done so. 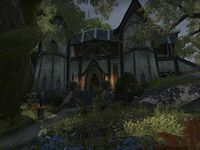 Crossing the other way will mark Marbruk Wayshrine if you have not yet visited Greenshade. This bridge joins the northern road of Tarlain Heights in Grahtwood with the southeastern road of the Xylo River Basin in Malabal Tor. When you pass through into Malabal Tor, you will be given the map marker for Velyn Harbor Wayshrine if you have not yet discovered it. Crossing the other way will mark the Haven Wayshrine if you have not yet visited Grahtwood. This bridge connects the eastern end of the Gavaudon region of Stormhaven with the city of Evermore in Bangkorai. 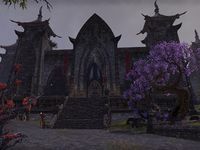 When you cross over into Bangkorai, you will enter directly into Evermore, marking both the city and its main Wayshrine on your map if you have not yet discovered them. Crossing the other way if you have not yet visited Stormhaven will unlock Koeglin Village Wayshrine. 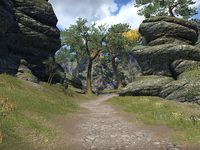 The Gates of Craglorn and Bangkorai Gate are the opposing sides of the gate connecting the Fallen Wastes of Bangkorai with the west of Lower Craglorn. 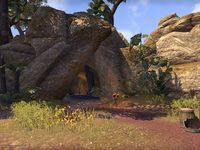 When you pass through into Craglorn, the Belkarth Wayshrine will be marked on your map if you have not already discovered it. Crossing the other way will unlock Evermore Wayshrine if you have not yet visited Bangkorai. 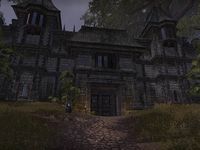 This pass through the King's Guard mountain range connects the town of Crosswych in the King's Guard region of northeastern Glenumbra with Alcaire in western Stormhaven. When you pass through into Stormhaven for the first time, Koeglin Village Wayshrine will be marked on your map. 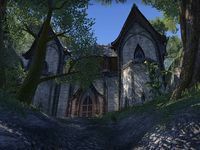 If you pass through the other way and have not yet visited Glenumbra, Daggerfall Wayshrine will be marked on your map. 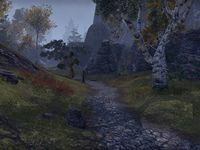 This pass connects Newgate in northwestern Stormhaven with Oldgate in southern Rivenspire. 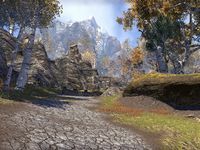 When you pass through into Rivenspire for the first time, Oldgate Wayshrine will be marked on your map. If you pass through the other way and have not yet visited Stormhaven, Koeglin Village Wayshrine will be unlocked. 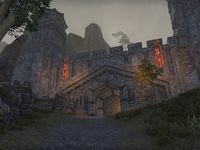 This gate divides the Argonian-controlled region of Bal Foyen in northern Morrowind with the Indoril-controlled Daen Seeth region of eastern Stonefalls. When you pass through into Stonefalls, Davon's Watch Wayshrine will be marked on your map. If you pass through the other way into Bal Foyen, Dhalmora Wayshrine will be unlocked. This gate connects the Lagomere region of central Deshaan with Reticulated Spine in northern Shadowfen. 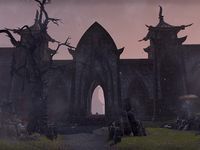 When you pass through into Shadowfen, Stormhold Wayshrine will be marked on your map if you have not yet discovered it. If you pass through the other way and have not yet visited Deshaan, Quarantine Serk Wayshrine will be unlocked. This gate connects the Redolent Loam region of western Deshaan with Varanis in southwestern Stonefalls. When you pass through into Deshaan for the first time, Quarantine Serk Wayshrine will be marked on your map. If you pass through the other way, Davon's Watch Wayshrine will be unlocked if you have not yet visited Stonefalls. This pass connects Shor's Stone in the Stony Basin region of The Rift with the Icewind Peaks region in southeastern Eastmarch. When you pass through into The Rift, Fallowstone Hall Wayshrine will be marked on your map if you have not yet discovered it. If you pass through the other way and have not yet visited Eastmarch, Windhelm Wayshrine will be marked. This pass through the Velothi Mountains connects Fort Virak in the Zabamat region of northwestern Stonefalls with the Smokefrost Peaks in the southeast of The Rift. To reach the pass without going through Fort Virak, you can skirt the fort to the north and follow the ravine below the bridge. Once you pass under, you should see hills to your right which can be climbed to reach the other side. When you cross through into The Rift, Fallowstone Hall Wayshrine will be marked on your map if you have not yet discovered it. If you pass through the other way, Davon's Watch Wayshrine will be marked if you have not yet visited Stonefalls. 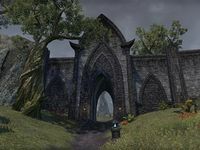 The portal at Cadwell's Hovel, south of The Hollow City, connects to a Fighters Guild hall in your alliance's home territory: Vulkhel Guard, Wayrest, or Mournhold. 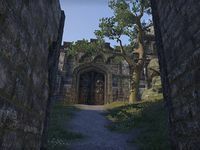 The Cyrodiil Gate Garrison in southeastern Craglorn is ostensibly a Daggerfall Covenant entry point into Cyrodiil. 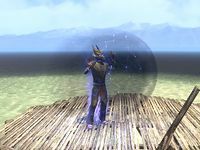 However, the gate cannot be opened by players of any alliance, since Cyrodiil must be entered using the Alliance War interface. Geographically, it appears to link indirectly to the Northern High Rock Gate. 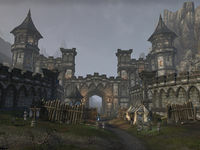 Friendship Gate is the gate connecting Firebrand Keep in Stormhaven with western Wrothgar, near the ruins of Old Orsinium. Passing through into Wrothgar for the first time will unlock the Merchant's Gate Wayshrine, while crossing the other way will unlock Koeglin Village Wayshrine if you have not yet visited Stormhaven. 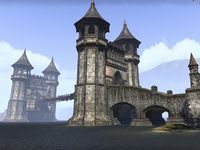 Merchant's Gate is the gate connecting northwestern Mournoth in Bangkorai with central Wrothgar, near the city of Orsinium. 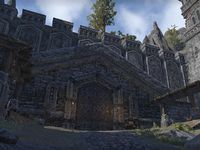 Passing through into Wrothgar for the first time will unlock the Merchant's Gate Wayshrine, while crossing the other way will unlock Evermore Wayshrine if you have not yet visited Bangkorai. 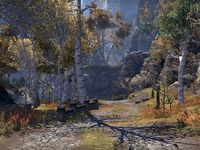 Prior to the release of One Tamriel with Update 12, the cart to Craglorn and the ships between starter cities required your character to have reached Level 50. This page was last modified on 18 June 2018, at 23:42.